Travel from Turpan to Korla (approximately 5 hours). On your way to Korla you’ll stop at the Iron Gate Pass. Historically the Iron Gate Pass was of strategic significance because it formed a vulnerable bottle-neck on the Silk Road. A military checkpoint was established at the pass during the Tang Dynasty. Many domestic tourists come to visit the gate because they are attracted by a famous love story, which your leader will no doubt tell you! Arrive in Korla, a mid-sized city in central Xinjiang. You might be surprised at the size of the cities in such a remote location. Lying at the south foot of Tianshan Mountains, and northeast of the Tarim Basin, Korla sits along the banks of the Kongque River. 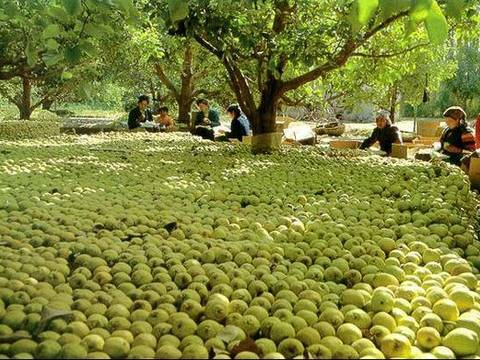 The town is known for its pears, which are popular all over China. Take an evening stroll along the Peacock River, which flows through the centre of Korla.